Every year, the Crew votes for their favorite vendors from all of the vendors we reviewed during the year. It was really challenging this year, I thought, as we had 57 different vendors to choose from and some incredibly amazing products. I didn't review many products, but I did see most of them. My job involves getting a good look at products before the Crew run, and while my kids were hands-on for at least a bit with virtually every vendor, there weren't that many that we incorporated into our lives right now. So here is a semi-random list of the vendors the Crew voted as best, along with some of my comments. Veritas Press got my vote as All Around Crew Favorite, and it got the vote from the Crew as well. We are just finishing up the Ancient History program online, and plan to move on to do Ancient Greece and Rome starting in January. Richard voted for this for Kids' Choice (it didn't win that though), if that tells you anything about how much we have loved it. However, it did win Favorite History Program and Best Digital Resource. It was also a very, very close second in a few other categories. Roman Roads Media was voted as Teens' Choice by two of my children, though it did not win that category. We've absolutely loved learning with Wes Calihan using Old Western Culture: The Greeks. Roman Roads did win Favorite High School Resource, and was a very, very close second in a few other categories. Well deserved. Middlebury Interactive Languages was the Teens' Choice vote from my other teen. It also didn't win that category, but it did win Favorite Foreign Language Curriculum. Thomas is LOVING his online German class. Favorite Math Program was CTC Math. My children are all using this at the moment, and I cannot say enough wonderful things about it. I did not write a review of this, though I probably should. Crew reviews are at the blog though. Favorite Christian Education Supplement was The Brinkman Adventures. Besides loving the family's name, we also really enjoy the stories. Rumor is that a third volume is in the works. Logic of English won Favorite Elementary Resource. I love Logic of English, though I've never written a review. You can see the Crew Reviews though. Progeny Press won Favorite Literature Curriculum. We used The Courage of Sarah Noble this year, for elementary ages. I do really like their materials! The winner in the Just For Fun category was Out of the Box Games. I posted a review of this one today. Teens' Choice winner, in an incredibly tight race, was Homeschool Piano. I really liked this program too. Piano lessons that don't require you to travel, as you bring the teacher to your computer screen? Pick me. Crew reviews can be found on the Crew blog. 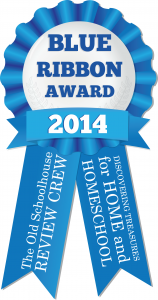 That's only a handful of the categories (ten of the twenty-seven awards), and you can check the Crew Blog for the other Blue Ribbon Award Winners. Lots of great companies, and some fabulous vendors coming along for next year. Are you interested in joining the Crew? With the huge influx of vendors for 2015, we are taking applications again. Check out the information. Love, love being part of this fabulous organization.